PEBBLE BEACH, Calif. – Aug. 08, 2016 – Automotive Fine Arts Society (AFAS) member Tony Sikorski will test conventions of automotive art with his sculptures at the Pebble Beach Concours d’Elegance® on Sunday, Aug. 21, 2016, from 9:00 a.m. to 4:30 p.m., in Pebble Beach, California. A master of crafting automobiles in a never-before-seen way, Sikorski is known for simplifying the shape of the automobile into pure design elements and then adding unique twists. Ranging in sizes from 21” to 24”, Sikorski’s sculptures were created using a variety of mediums featuring fascinating angles and proportions. 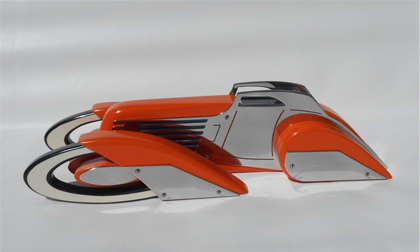 His sculpture titled “California Gran Tour” depicts a luminous silver-plated and etched car with a navy color scheme. This sculpture features a smooth, sleek style from front to back that resembles a futuristic racer. Incorporating a geometric frame along with razor-sharp detailing and cutting-edge lining, this vibrant orange and silver sculpture titled “Orange Crush” uses an aesthetically appealing color palette. Slick with fresh paint and innovative design, this vehicle is striking because of its sharp features. Commissioned by corporations and private collectors worldwide, Sikorski’s talents have been highly sought after since his career began in 1963, when he won a scholarship to the Ivy Art Institute of Graphic Design in Pittsburgh. His work has earned recognition from publications such as Car Collector, Robb Report, Mobilia, Automobile Magazine and AutoWeek. AFAS was established in 1983 by a group of artists who are acknowledged by critics to be among the best in their field. Members work in many diverse mediums including oil, watercolors, acrylics, wood, gouache, pen & ink, clay and metal. AFAS and its members participate in select shows across the country including the Pebble Beach Concours d´Elegance, Dana Point Concours d’Elegance and the Amelia Island Concours d´Elegance. Information about AFAS is available at www.autoartgallery.com or by contacting Tyler Weiland at 214.520.3430 ext. 302 or Tweiland@tprm.com.